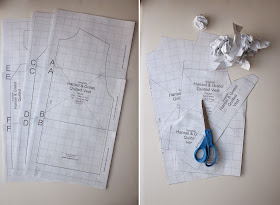 Download PDF pattern pieces HERE. Main Fabric - ¾ yard if 54” wide. More if matching a pattern. Linging Fabric - ¾ yard if 54” wide. More if matching a pattern. Thread – 2 spools thread to coordinate with main fabric. 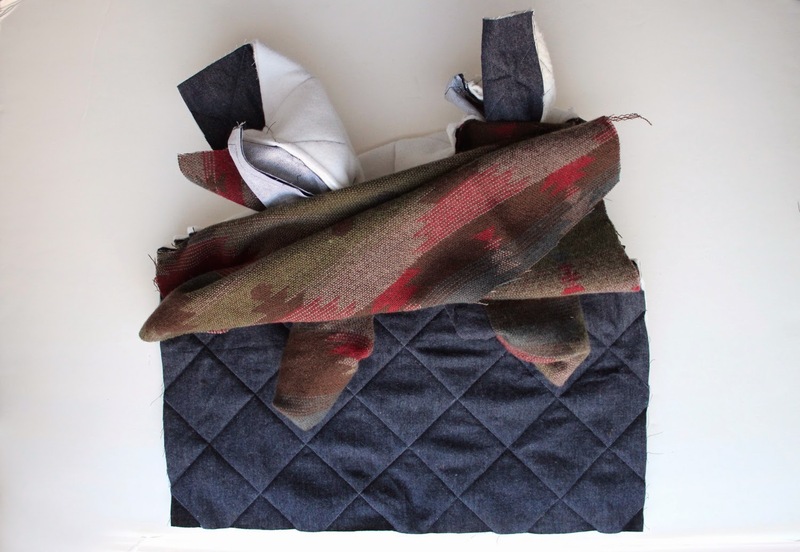 Main Fabric : Light weight woven fabrics, chambray, shirting, quilting cotton, other fabric that is easily ironed. 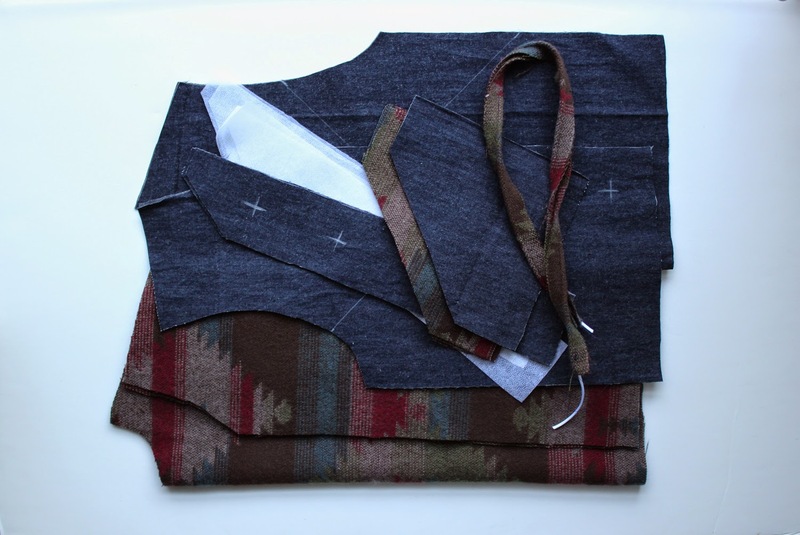 Lining Fabric: Cotton flannel, light weight woven cotton, cotton shirting, other fabric that is easily ironed. 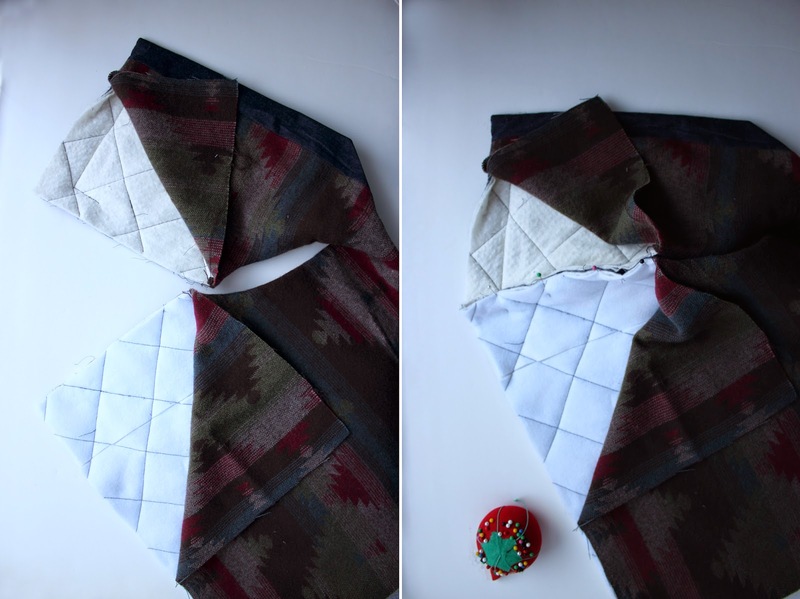 -This pattern is for personal use only. -Seam allowance is ½” unless otherwise noted. -Unless specific instructions are givien for seam finishing trim and press them open. 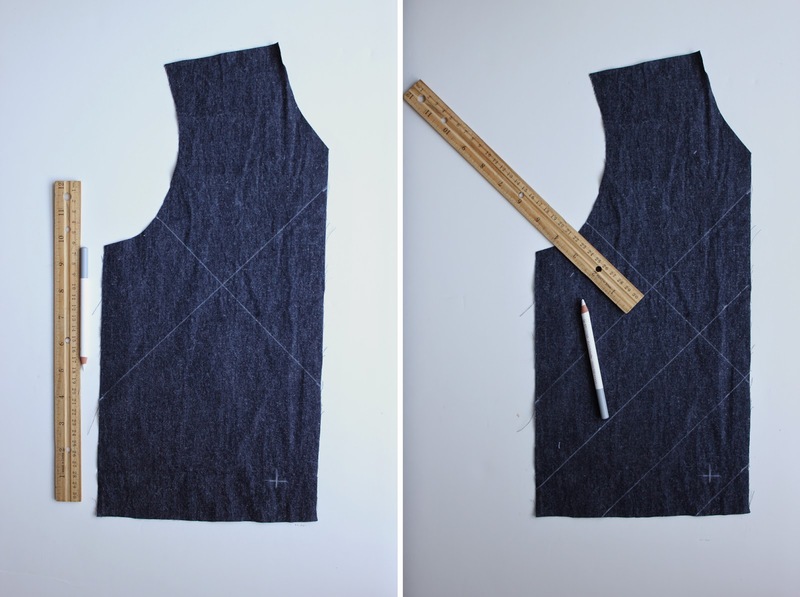 All seam allowances will be encompassed in the inside of the garment, therefore the finishing can be simple. Finished Chest Measurement: 31 1/2"
Finished Length Shoulder to Hem: 16 1/2"
1. 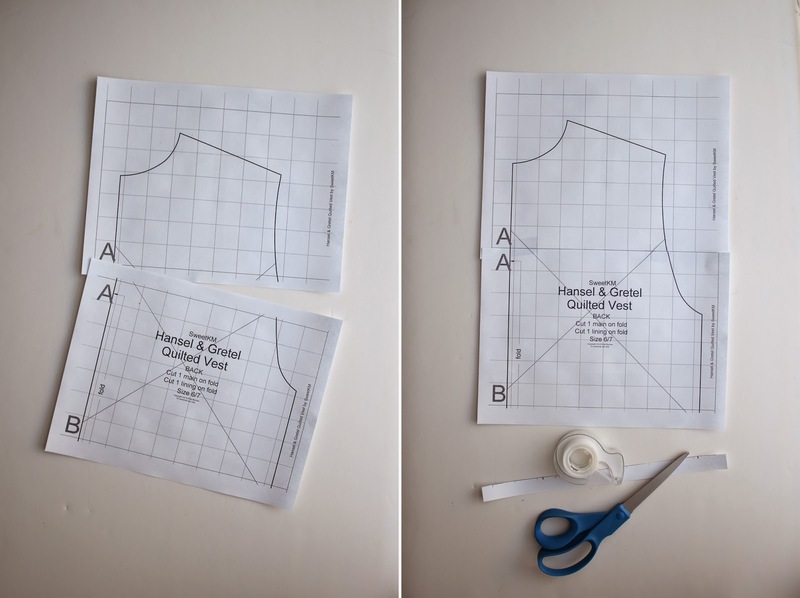 Print the PDF pattern pieces. Ensure that you are printing at 100% by checking that the guide square on the first page is 1"x1". 2. Assemble your pattern by matching the letters and aligning the grid lines. Cut out the pattern on the cut line. 3. 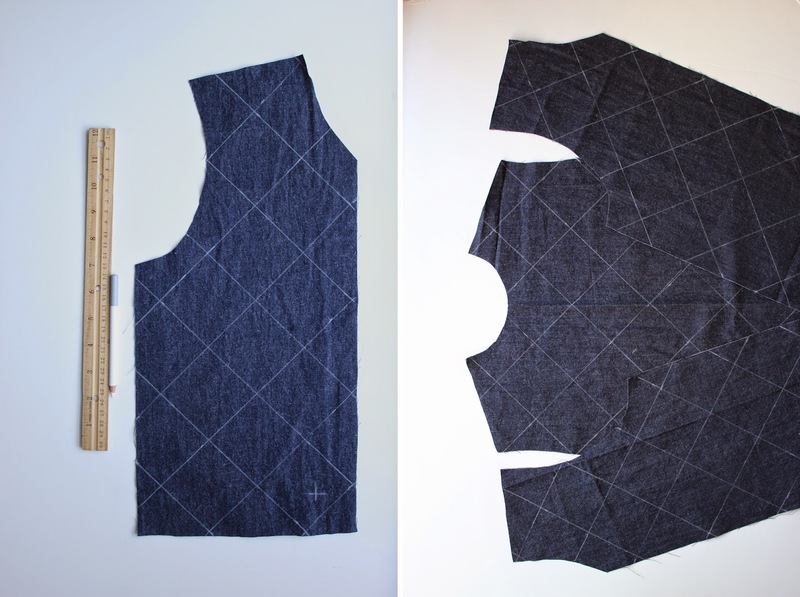 Lay out the pattern pieces on the fabric. 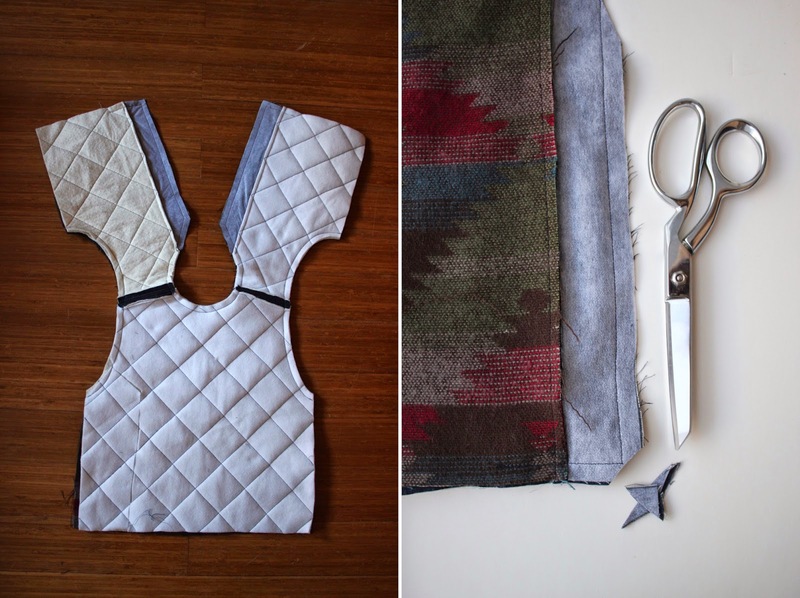 Cut fabric. 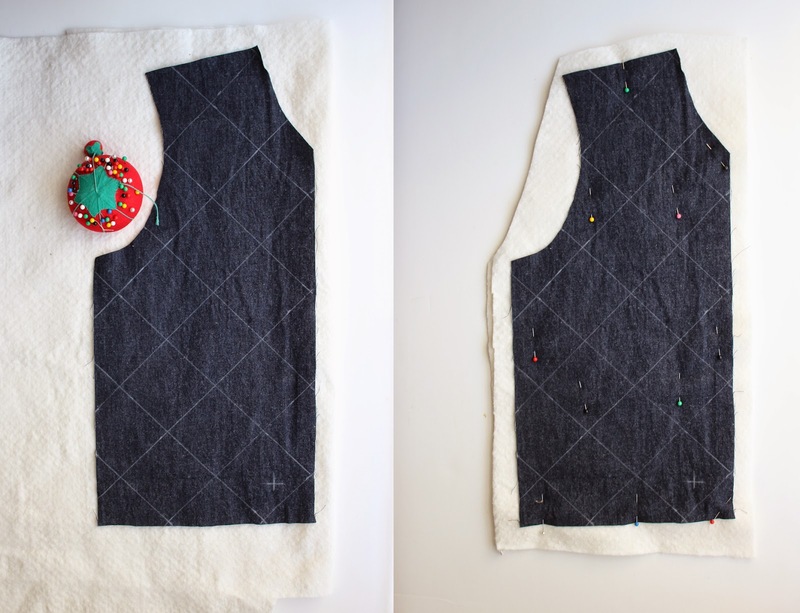 Transfer all pattern markings for the quilting guidelines, pocket and snap locations to the main fabric. 4. 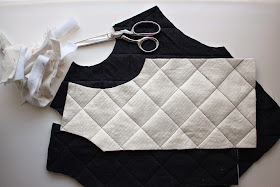 Layout the quilting grid by making parallel lines 2 1/2" from each side of the quilting guide lines with a chalk pencil. 5. Continue the grid in both directions for each guideline, until the fabric is uniformly covered by the quilting grid. 6. Double the batting. Lay main fabric pieces over the doubled batting, pin lightly. 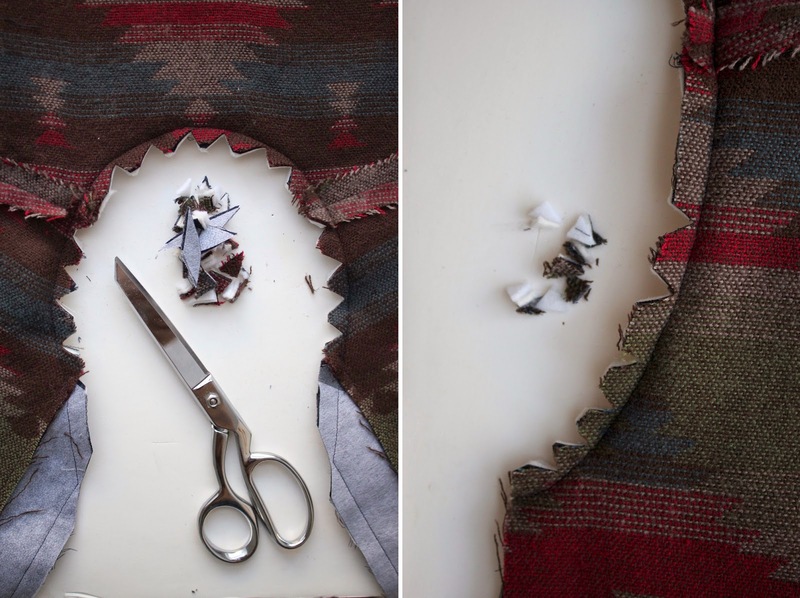 Cut the batting around the main fabric leaving a 1" boarder at all around. 7. Top stitch on top of each quilting guideline from edge to edge beginning with the center most guideline. 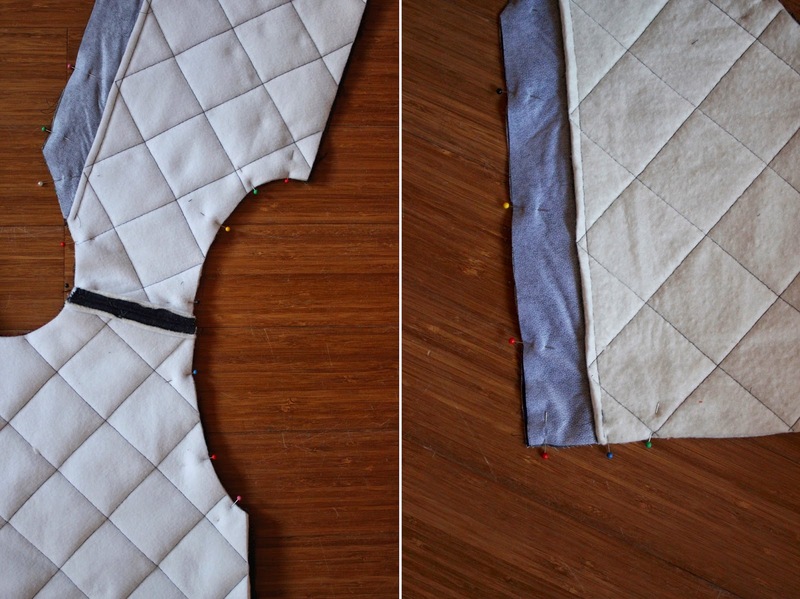 Repeat top stitching with each guideline working out from the center, until all of the guidelines are topstitched. It is not necessary to backstitch when quilting, simple sew off the edge of the main fabric onto the batting. 8. Trim excess batting along the edge of the main fabric. 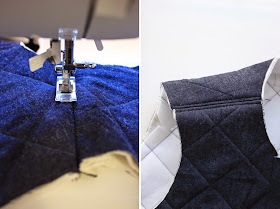 It is okay to cut through the over run lines of quilting stitches. 9. Fuse facings to the wrong side of all of the snap band pieces. 10. 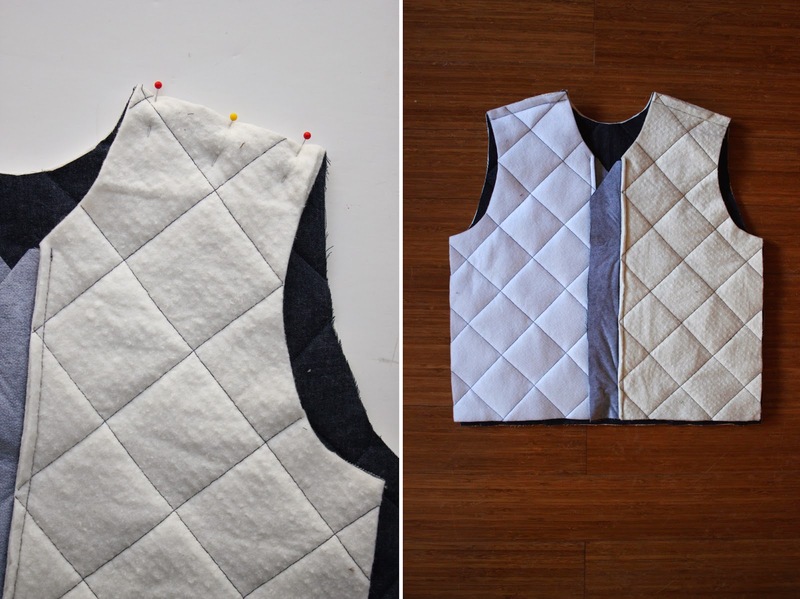 Right sides together align the snap band with the front opening of each vest front piece (main and lining). Sew. 11. Trim seam allowance to 1/4". 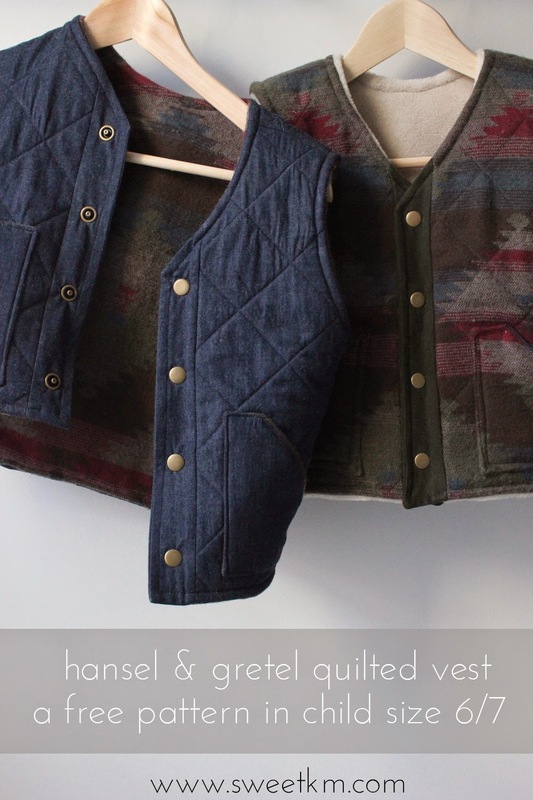 Press seam allowance toward the button band. 12. With the main fabric pieces, align the shoulder seams with right sides together of the vest front and vest back. Pin lightly, and sew. 13. Press the seam open. Top stitch 1/8" from the shoulder seam on each side. This will cut down on the bulk at the seam. 14. 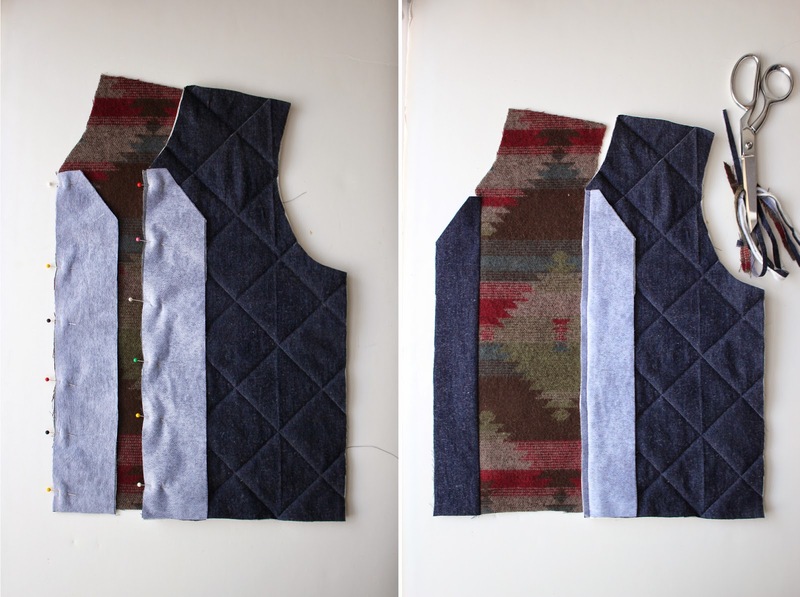 With the lining, align the shoulder seams with right sides together of the vest front and vest back. 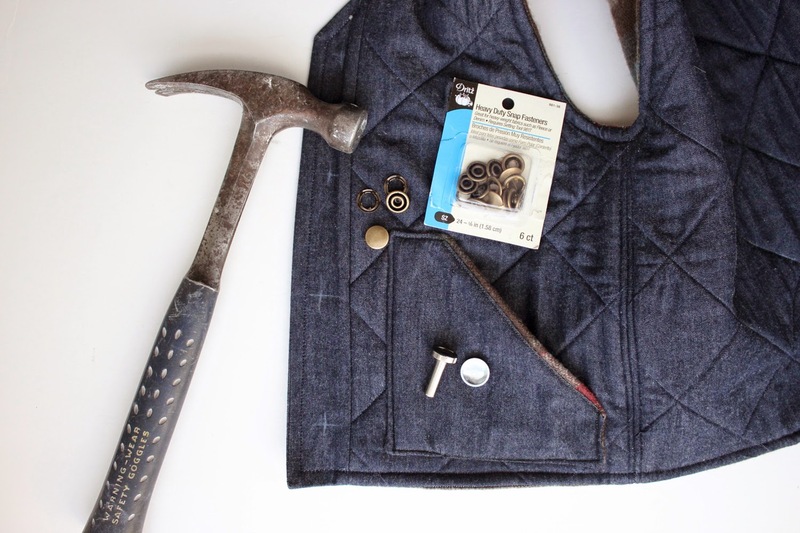 Pin lightly, and sew. Press open the seams. 15. 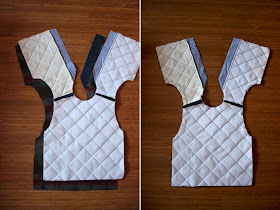 Right sides together, position the vest body of the main fabric over the vest body of the lining. Match up the shoulder seams, and edges. 16. Pin lightly at each arm opening, from side seam to side seam. Pin from 1" before the start of the snap band at the front right waist, up around the neck opening, down to 1" past the snap band at the front left waist. 17. Sew the front opening where pinned. Sew each arm opening. 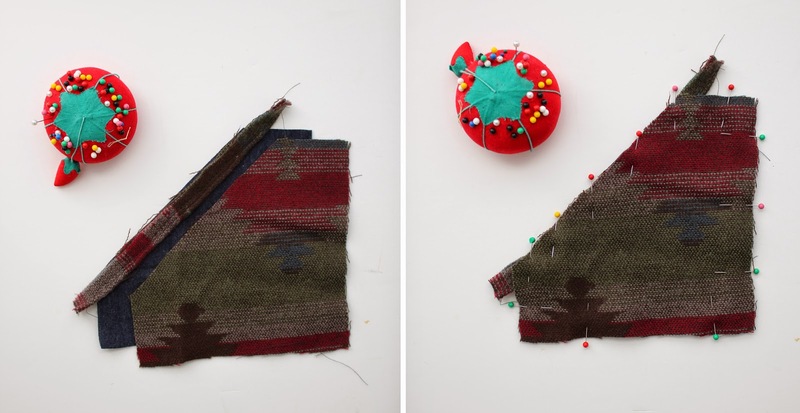 Be sure to back stitch at beginning and end of stitching. 18. Trim seam allowance to 1/4". 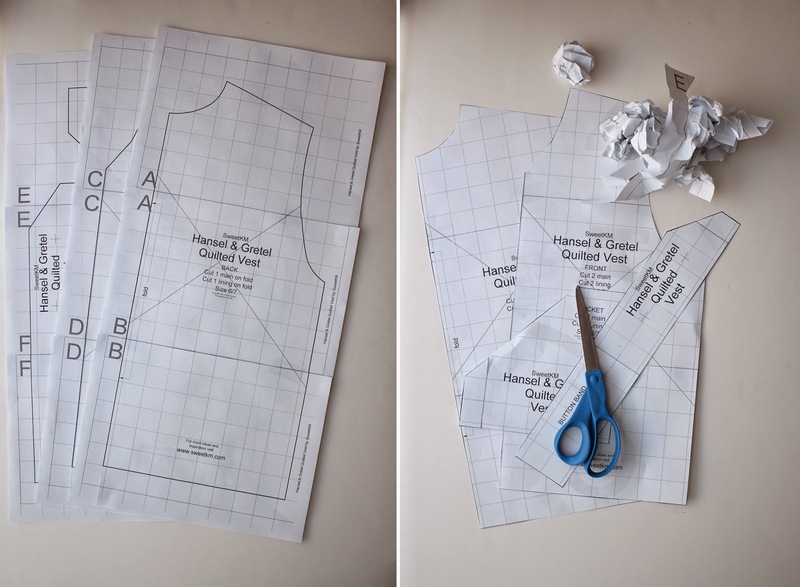 Snip notches into the seam allowance around the curves. Trim corners. 19. 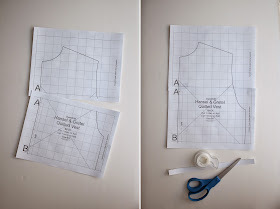 Turn garment right side out through the shoulders. 20. 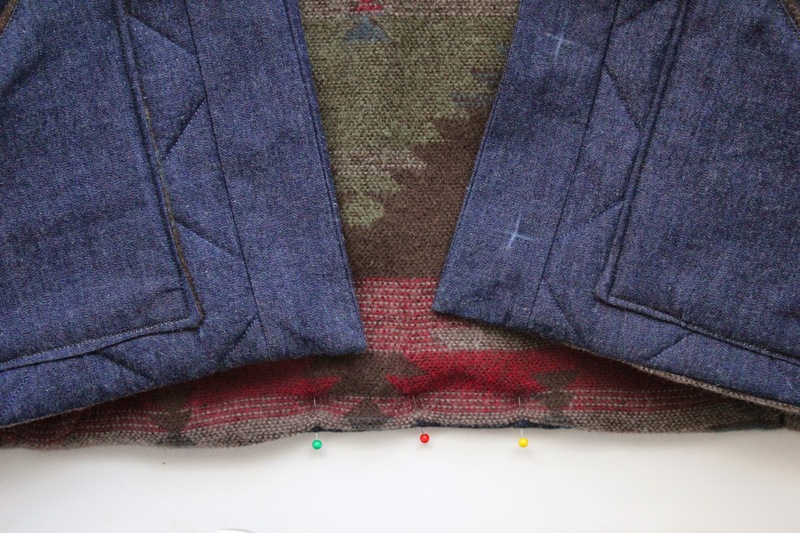 Press to crisp seams. 21. 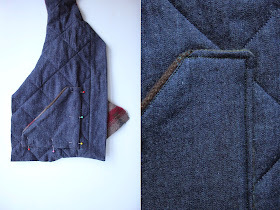 Position a 9" piece of piping along the slanted edge of the right side of each pocket front. Pin. 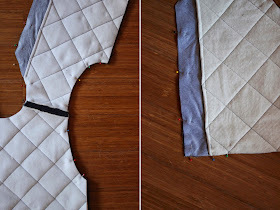 Use the zipper foot and baste piping to the pocket 3/8" from the edge. 22. Right sides together position the pocket lining over the main fabric pocket piece sandwiching the piping in between. Pin. 23. 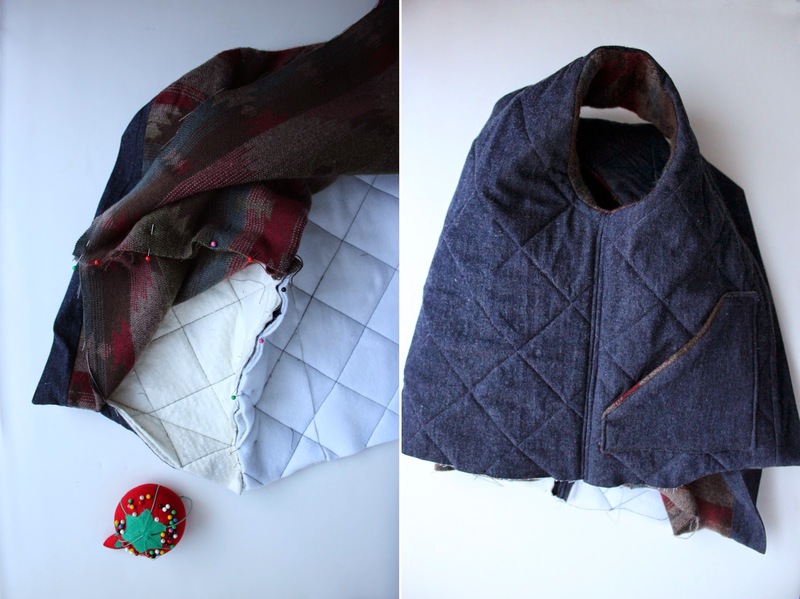 Sew the pocket lining to the main fabric pocket piece leaving a 3" opening along the bottom. 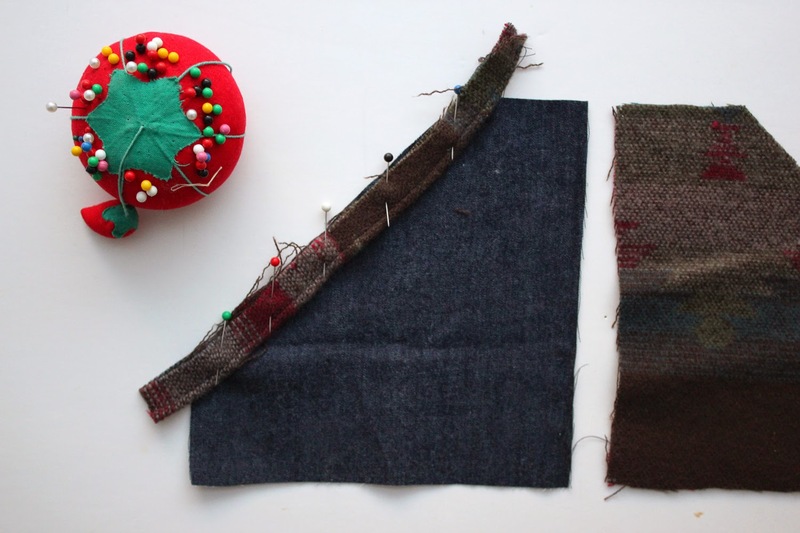 Backstitch at both ends. 24. Trim seam allowance to 1/4". Trim corners. 25. Turn pocket right side out through hole left in the bottom edge. Use a knitting needle to poke the corners into square. Iron to crisp the seams. 26. Topstitch along piped edge 1/8" from the piping. 27. Repeat with other pocket. 28. 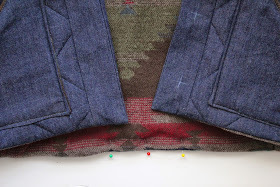 Position pockets so that the inside corner is on the pocket placement mark. 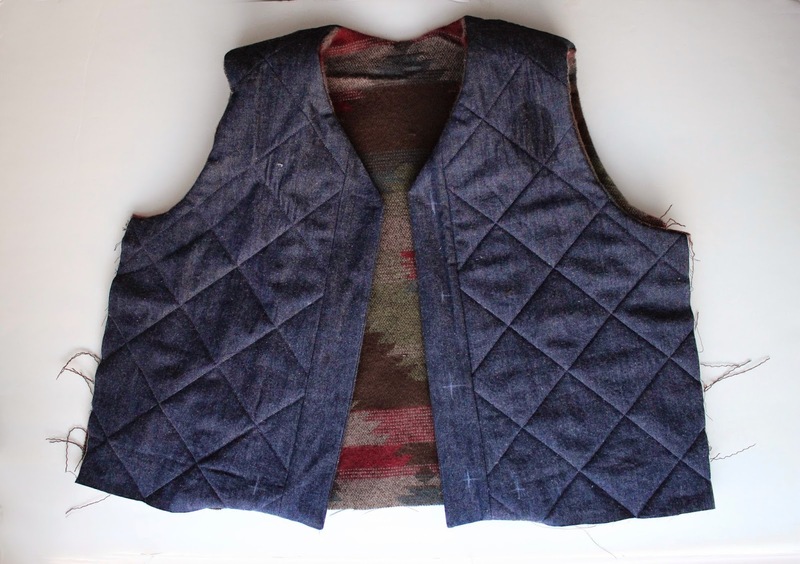 Make sure that the long edges of the pockets are parallel to the bottom edge of the vest, and the button band. Pin pocket to the main fabric only. 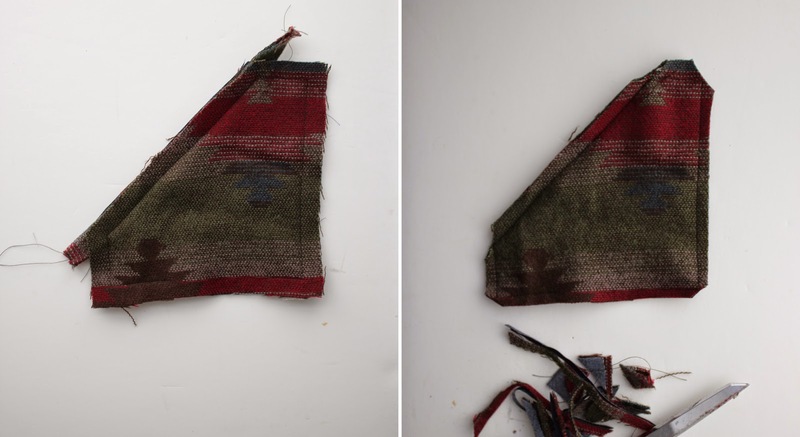 Do not pin through the lining. 29. Holding the lining out of the way of the stitching, top stitch the pocket to the main fabric 1/8" from the pocket edge. Leave the piped edge open. Backstitch thoroughly at the edges of the pocket opening. 30. 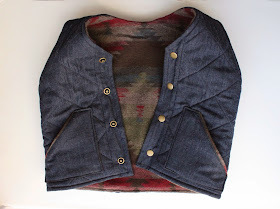 Align the underarm seam, and pin the main fabric from the underarm to the bottom edge with right sides together. 31. Then pin the lining with right sides together from the underarm seam to the bottom edge of the lining. 32. Sew the side seam starting from the bottom edge of the lining, through the underarm, to the bottom edge of the main fabric. 33. Press open the seams. On the main fabric only, top stitch 1/8" from each side of the side seam. This will cut down on the bulk at the seam. 34. 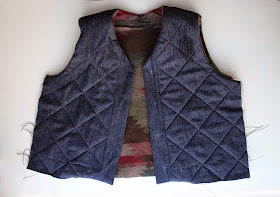 Turn the vest partially wrong side out by pulling the bottom edge up over the shoulders so the shoulders are tucked inside the body of the vest. 35. With right sides together align the side seams of the lining with the side seams of the main fabric. Pin along the bottom edge of the vest. 36. 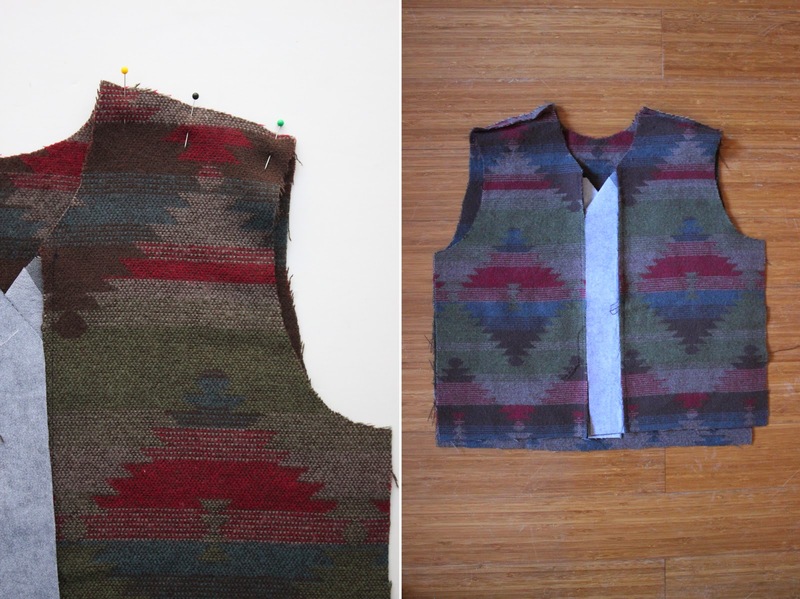 Sew leaving a 6" opening in the center back of the vest. Backstitch at each end. 37. 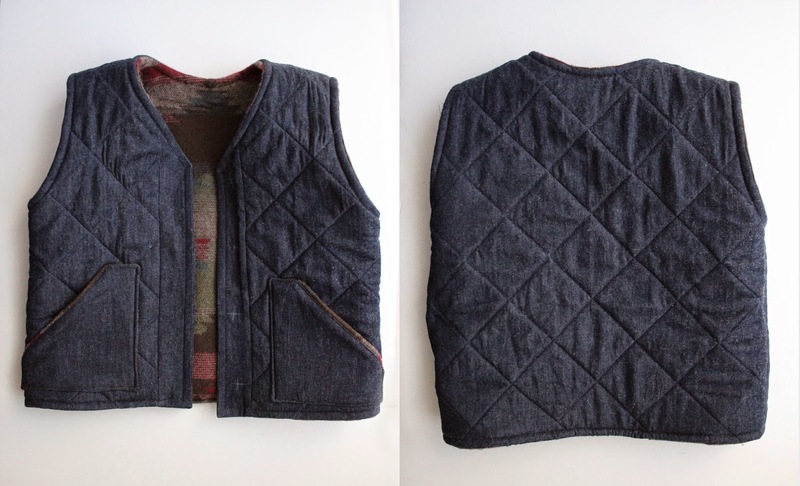 Pull the vest right side out through the opening in the vest back. 38. 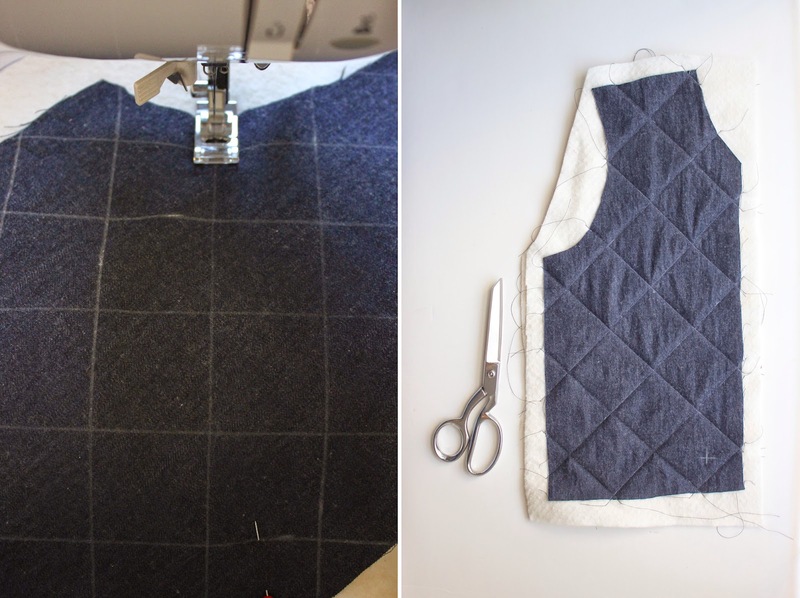 Turn the edge of the opening under to match the overall hem line. Pin. 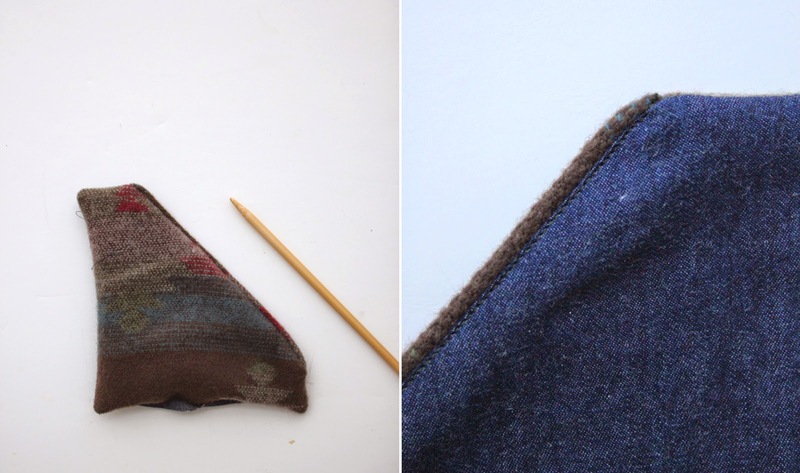 Press hem to crisp the seam. 39. 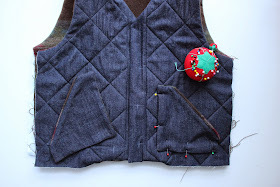 Pin lightly along all of the edges to hold a consistent seam line (particularly important with bulky fabrics). 40. Top stitch 1/4" from all of the edges: hem, front opening, each arm hole. 42. Verify the location of the snaps. 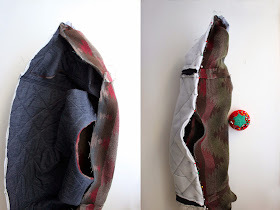 They should be positioned down the middle of the snap band between the line of outer edge top stitching, and the bump of the seam allowance where the snap band attaches to the body so that the snaps are only going through two layers of fabric. Each snaps are spaced 3" on center. Instagram @kristi_sweetkm or using hashtag #sweetkmpatterns. Please send all feedback, suggestions and constructive criticism to sweetkm1[at]yahoo[dot]com.